​New Summit Academy's Student Council system is another wonderful example of how students are empowered to run important aspects of their community. Every quarter, students apply for positions and give speeches to garner support for their election. 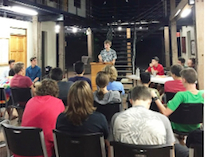 If running against opponents, students debate in front of the student body to earn the position. The President is the head of Student Council. He works with the Staff Liaison to prepare meeting agendas, promote a productive flow of Student Council initiatives and encourage support and participation from the student body. The Vice-President is responsible for ensuring all Student Council meeting notes are documented and communicated to the student body. The Proposals Officer is responsible for gathering information from the student body about new initiatives or proposed adjustments to the current student life handbook, policies, and protocols, as well as following up on writing, gathering feedback, editing, and advocating for proposals. The Activities Officer is responsible for gathering information from the student body about preferred recreational activities, working with staff to co-plan the calendar and coordinate logistics for activities. The Activities Officer is also responsible for signing up students for recreational and PE activities each week. The Treasurer works on allocating and implementing the student portion of the campus life monthly budget. The Academics Officer works with staff and students on any academic issues or trends in the community. The Orientation Officer works with student mentors and new student activities during the Orientation period. The Operations Officer works with students and stuff to ensure that dorm and facility issues are reported and addressed. NSA's handbook is a living document. Some rules are non-negotiable (safety, etc. ); however, other rules and procedures are able to be adapted to each peer community through our innovative and empowering proposal system. ​Students seek a staff sponsor for their idea, and then they complete the proposal in the indicated format, addressing all areas requested by the procedure. Once the proposal has received feedback and has been edited, it is submitted to the appropriate committee for approval.